An image of ancient architecture contrasted against a backdrop of vivdly green landscape represents the country of Romania, which features a diversity of landscape that has been largely undeveloped. With numerous mountain, valley, and lakeside resorts, an abundance of activities await outdoor enthusiasts. The other side of Romanian tourism is its impressive collection of ancient ruins, prehistoric fortresses, and medieval castles. Many of these date back to prehistoric times, the Ottoman Empire, and Austro-Hungarian rule, the influences of which are still apparent in preserved details. 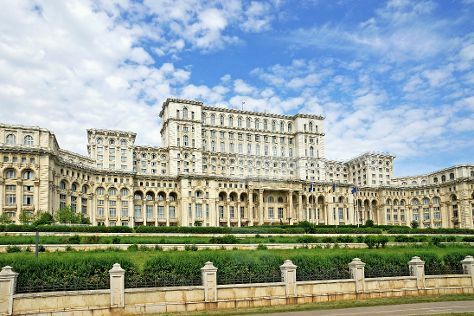 Tourism in Romania is not as prevalent as other countries, which this makes the travel experience here feel more authentic and awe-inspiring. Check out this simple but captivating country and discover its natural and historic beauty. Romania is in Europe. Use our Romania trip planner to arrange the details of your trip to Romania and other destinations.